Last year Lynn Streeter introduced us to an exceptional young man by the name of Matthew Ceelen. Matt's story began with a letter to our club requesting financial support for his Eagle Scout project of building two bat houses to be placed in the Mequon Nature Preserve. With the request approved, we heard what Paul Harvey used to call "The rest of the story". 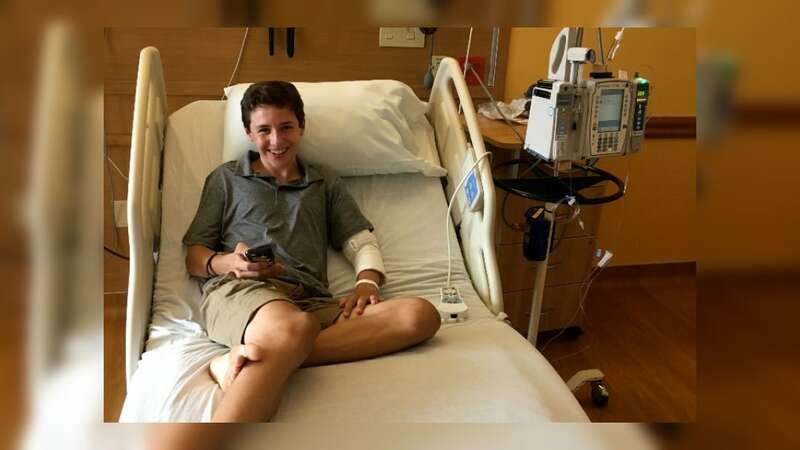 Matthew was diagnosed with bone cancer just weeks shy of his 15th birthday. In medical terms it is a high grade sclerosing subtype of osteosarcoma. Approximately 450 children in North America are diagnosed with osteosarcoma each year. He is 1 of approximately 4 children who will be diagnosed with his subtype of osteosarcoma in 2017. He was in the OR for a couple hours on Thursday. Everything looked really good! The drain will remain in his arm for a couple of weeks. They also took out the sutures in his leg. This is the area where the skin graft, from his left thigh, was placed in order to close the area where his fibula was removed. He enjoyed his traditional inpatient visit with John St. Peter and Bill Jarecki. They have visited Matthew, barring illness, every time he has been admitted since his chemo journey began in September of 2017. He also had friends visit which he truly appreciates.